(By Neepjyoti Gogoi, discovernortheast.in) Ever dreamt of a destination – isolated and still remains in its pristine form! Hard to believe? Is it? Or maybe not. A place far from any habitat and inaccessible by road- is no less than a heaven on earth. This is Subansiri for you. Subansiri River is the largest tributary of the mighty Brahmaputra. It is also known as Gold River and is popular for its gold dust. The river descends from the Great Himalayan ranges in China, covering Tsona Dzong till the Great Loop of the Tsang Po River in Tibetan Territory. Further, it cuts through the Eastern Himalayas to enter India at Asaphila via the rocky and remote neighbourhoods of Arunachal Pradesh before merging into the mighty Brahmaputra near Lakhimpur district of Assam. The river stretches for about 450 kms, less than half of which flows in Tibetan Territory. It is famous for its vigorous waves which make travelling downriver, quite arduous and difficult. The river with its might, surge and adrenaline-pumping torrents makes an ideal spot for river rafting. The river flows through the green tropical rainforest in the state of Arunachal Pradesh. Subansiri is an ideal destination for adventurous souls who love being close to nature. We too experiencd such adventure to this serene place – A fishing adventure or popularly known as ‘Angling’. Our distinguished clients flew all the way from London to Dibrugarh for the wonderful Subansiri expedition. 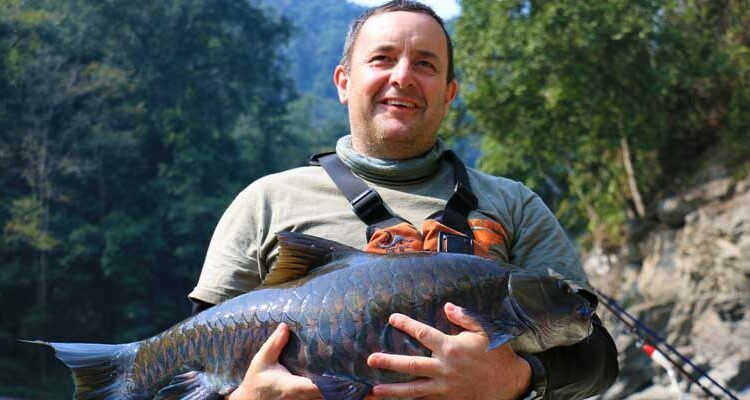 It is hard to believe, why to come all the way from London to Arunachal Pradesh, for ‘Angling’? Well the answer lies in the words of Martin Salter. 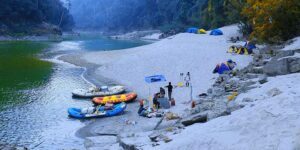 He said, “If anyone harbours a dream to battle with the mighty Mahseer, in a wild and remote river, there is no better place to visit than Subansiri”. 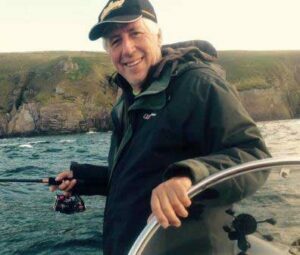 Martin is a retired Labour Politician and former Parliamentary spokesman for Angling, who now works as a National Campaigns Coordinator for the Angling Trust – the United Kingdom’s governing body for all forms of recreational fishing. He left the House of Commons in 2010 and has fished all over the world catching Tarpon, Marlin, Bonefish, Barramundi, Kingfish, Giant Trevally, Sailfish and Tuna. He was accompanied by Keith Elliott, editor of the Classic Angling magazine in the UK, Mark Edwards, a very successful predator angler and Mike Robinson, Martin’s fishing travel partner with whom he has twice fished for the larger hump-backed Mahseer (Barbus Tor) in Southern India. 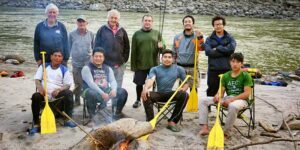 The purpose of Martin and his team’s visit to Subansiri was to cover a show named ‘Fishing Britain – Episode 41’ for the Angling Trust in UK. Day 1: We left Dibrugarh for Pasighat. On our way, we had to cross the mighty Brahmaputra with a ferry ride to reach Pasighat. It took us around 6 hours. It was overwhelming to be the guide on a trip with dignitaries, who were Angling experts. We shared some chit-chat about their fishing expeditions and the upcoming Subansiri to pass our time. Actually, they all were very excited to begin this journey. Day 2: We started our journey for Daporijo – the starting point of our Sailing expedition. The journey was a bit long and took us around 12 hours. We spend the whole day travelling and shared travel stories. The excitement for the next morning made the travel fatigue worth it. Day 3-11: Before starting our Sailing and Angling expedition, we ensured carrying essentials for the next 7 or 8 days. Thereon, we finally started our expedition which would take us through the mysterious force of the mountain, crossing meagre settlements of local tribes and wilderness. We camped at nights gloriously by the fire in pristine patches of sandy riverbank, with shiny stars revealing the sky. *Note- One should never underestimate the nature and its forces, thus carrying Safety Gears, Cooking utensils and stuffs which come handy in these situations – is actually a good idea. The fishing wasn’t easy, but the further we went downstream the more successful we were. Our first prey was a ‘Chocolate Mahseer’. We sailed during the day and camped for lunch, the afternoon was used for Angling. This was our routine for the next 8 days. 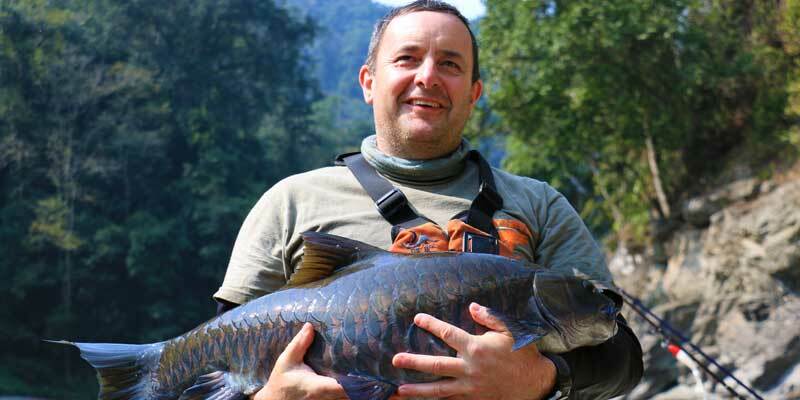 It was not until we went further downriver, we encountered the fish they had really come for – ‘Golden Mahseer’. The first one fell prey to Mark one evening behind a rock around 500 metres upstream of our camp. It was only about 5 lbs, but we were pleased to be in the zone. Accompanying Mark was Mike Robinson who caught one of the best fish of the trip – a ‘Chocolate Mahseer’ of 21 lbs. It was extremely rare as our chief guide had never seen such a big size. Three days of camping at the place named Golden Pools saw some fine catches including the largest of the trip – a 27.5 lbs beauty, which Martin caught across the current early one morning. That was not the only the great catch, as Mark got himself another 25 lbs fish. We also trekked to a local village and met the tribal people residing there, far from any human establishments. They were very welcoming and greeted us like their own. The luck wasn’t supposed to be on our side, as we lost any chance of angling in the last couple of days, when the river coloured up due to rainwater coming into one of the tributaries. Day 12: We made our way back the same way. They achieved what they came for and we nourished a great experience. “I would describe Arunachal Pradesh as one of the last wildernesses left on Earth. It is tough terrain but the local people are friendly, the fishing can be amazing and the scenery is simply stunning. If anyone harbours a dream to battle with the mighty Mahseer in a wild and remote river there is no better place to visit”. The words from Martin describing ‘Arunachal as one of the last wilderness left on Earth’ filled me with realization. The state is still virgin and unexplored. And the only way to not harm it – is by not interfering with the nature in any way. If you haven’t got the chance to travel to India’s Northeast, then get the chance! The region is a showcase of lush jungles, tribal cultures, mouth watering dishes and some amazing outdoor activities – all wrapped up in a highly enjoyable package that provides those visiting the region with a wide range of things to see and do. 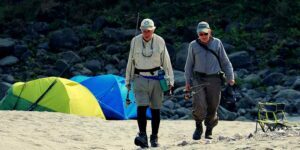 Subansiri is every angler’s dream. It is a hidden gem for anglers in the foothills of Himalayas. It also provides visitors with Rafting and Kayaking opportunities. HOW TO REACH: Arrive Dibrugarh or Guwahati (in Assam) and drive to Pasighat, the base to explore Eastern Arunachal Pradesh. NOTE: To visitArunachal Pradesh you have to get inner line permit. Permits can be acquired from Delhi, Kolkata, Guwahati or Dibrugarh.